What Causes Skin to Turn Dark Around the Ankles? Skin on the ankles is thin and easily visible, and may discolor for any number of reasons ranging from staining from wet clothes or boots to serious medical conditions. Because of the potential implication of circulation disorders, darkened skin around the ankles that is not immediately explainable by simple environmental factors should be promptly called to the attention of a medical doctor for appropriate diagnosis and treatment. Venous stasis causes pooling red blood cells to stain the skin of the ankles from the inside out, creating reddish or brown patches on the ankles, according to Dr. David Arkin, writing for Podiatry Network. Venous stasis refers to the medical condition resulting when leg veins lose their ability to carry blood back up the legs toward the heart. Venous stasis can occur due to injury, surgery or poor circulation, and it can indicate the presence of life-threatening blood clots in the deep veins. Prompt medical attention is required to rule out deep vein thrombosis and to obtain medication or other treatment to alleviate venous stasis before it progresses to a chronic or ulcerative stage. Ankle sprains cause bruising and discoloration, usually accompanied by swelling in the ankle region. Ankle injuries are exceedingly common in outdoor events like hiking, according to the National Outdoor Leadership School Wilderness Medical Institute. 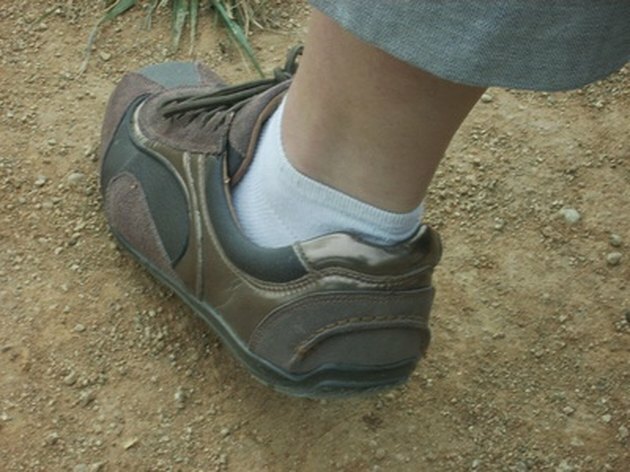 However, turned ankles also happen frequently under much more mundane conditions, such as stepping off a curb or walking in unsteady shoes on uneven ground. A sprain is a tearing of a ligament, which can rupture minor capillaries and lead to accumulation of blood under the skin in a blue to black bruise, which may well fade into interesting shades of brown, yellow, and green. Ankle darkening from a sprain will be accompanied by pain and a limited range of motion; if the injury was accompanied by a snapping sound, the discolored skin may also indicate a broken bone. Immobilize, ice and elevate the injured ankle until appropriate medical care can be reached, advises the Wilderness Medical Institute. Rocky Mountain spotted fever is a tick-borne infection. Despite the name, the disease is more prevalent on the East Coast of the United States, according to the Mayo Clinic. Symptoms may commence shortly after a tick bite, but may not appear for two weeks after exposure. Symptoms include fever, chills, headache and light sensitivity, as well as a rash of dark red or brown spots on the ankles and wrists. Within a few days, the rash spreads to the palms of the hands and soles of the feet, then up the arms and legs. Rocky Mountain spotted fever and other tick-borne diseases can be life-threatening, so seek medical attention immediately after noticing ankle or wrist discoloration or any other unusual symptoms after experiencing a tick bite or being outdoors in tick-infested areas.